About a month ago Jean got a cookie recipe from Martha Stewart that combines two of my favorite things: rich, dark chocolate and sour cherries. I've been thinking about how good they would be since she told me about them. Sunday afternoon I couldn't stand it any longer and decided to make a batch. They are even better than I imagined (and that's going some!) 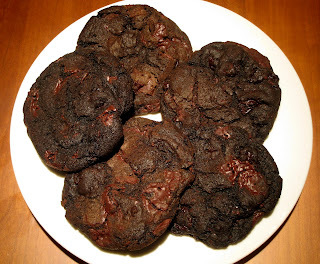 The cookies are chewy, rich and dark with intense chocolate flavor, punctuated by chunks of smooth dark chocolate and sweet, tart dried cherries. In the words of LL Bean, they are Wicked Good! I took some to work Monday morning for a meeting -- they were a big hit. Form balls of dough, each about 1/4 cup; place balls on baking sheet about 3 inches apart. Bake until puffed and cracked, 9 to 11 minutes. Transfer to a wire rack to cool completely. Store in an airtight container, at room temperature, up to 3 days. dear lord those cookies.... like heaven in a bite.